On the previous post we’ve installed and the base software for our Grafana based dash board. 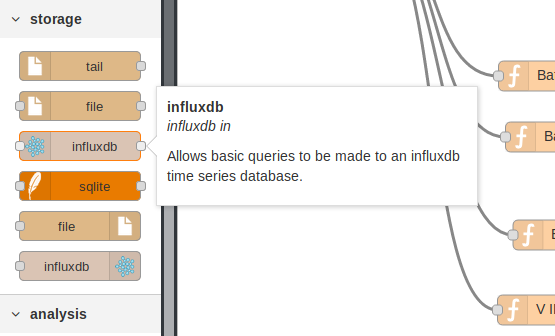 We need now to configure our InfluxDB database and Node Red to start collecting data. Detailed instructions for configuring an InfluxDB database are on this InfluxDB documentation link.. This allows to process all the data or only process data based on a certain tag or tags. Values and tags can be created on the fly without previously define them, which is a bit different from standard RDBMS engines. Note: error may be due to not setting a database or retention policy. Also note that no DDL (data definition language) was used to create the tags or the measured value, we’ve just inserted data for our measurement with the our tags and value(s) without the need of previously define the schema. There are two types of InfluxDB nodes, one that has an Input and Output and other that only has Input. The former is for making queries to the database where we provide on the input node the query, and on the output the results are returned. The later is for storing data only onto the database. A set of credentials are required, but since I’ve yet configured security, we can just put admin/admin as username and password. In a real deployment we must activate security. From now on it is rather simple. 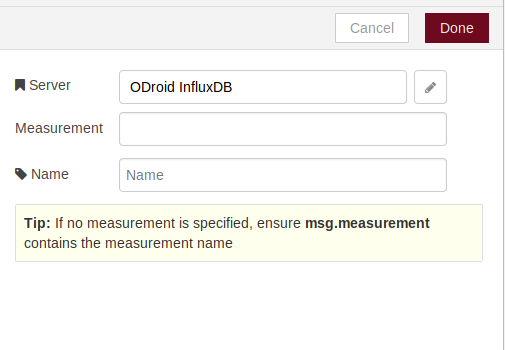 Referring to InfluxDB node configuration screenshot (Not the InfluxDB server configuration) we have a configuration field named Measurement. This is our measure name that we associate a value. Picking up on the above example with the Insert command it will be Temperature, for example. Now we have data that we can graph with Grafana, subject of my next posts. A more or less standard software stack used for control, processing and displaying data, has emerged that is almost used by everyone when hacking around on Arduinos, ESP8266, Raspeberry Pi’s and other plethora of devices. This “standard” software stack basically always includes the MQTT protocol, some sort of Web based services, Node-Red and several different cloud based services like Thingspeak, PubNub and so on. For displaying data locally, solutions like Freeboard and Node-Red UI are a great resources, but they only shows current data/status, and has no easy way to see historical data. So on this post I’ll document a software stack based on Node-Red, InfluxDB and Graphana that I use to store and display data from sensors that I have around while keeping and be able to display historical memory of data. The key asset here is the specialized time-series database InfluxDB that keeps data stored and allows fast retrieval based on time-stamps: 5 minutes ago, the last 7 days, and so on. InfluxDB is not the only Time-Series database that is available, but it integrates directly with Grafana the software that allows the building of dashboards based on stored data. 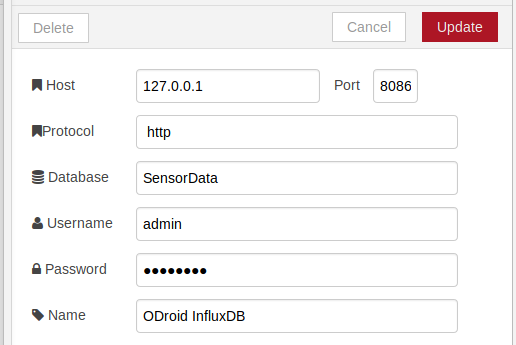 I’m running an older version of InfluxDB on my ARM based Odroid server, since a long time ago, ARM based builds of InfluxDB and Grafana where not available. This is now not the case, but InfluxDB and Grafana have ARM based builds so we can use them on Raspberry PI and Odroid ARM based boards. We can go to the InfluxDB downloads page and follow the installation instructions for our platform. In my case I need the ARM build to be used on Odroid. Copy the files to the right location. I’ve added the -i switch just to make sure that I don’t overwrite nothing. We need now to download Grafana. In my case for Odroid since it is an ARMv7 based processor, no release/binary is available. We can now access the server at the address: http://server:3000/ where server is the IP or DNS name of our ODroid or RPi. This ends the installation part for the base software. 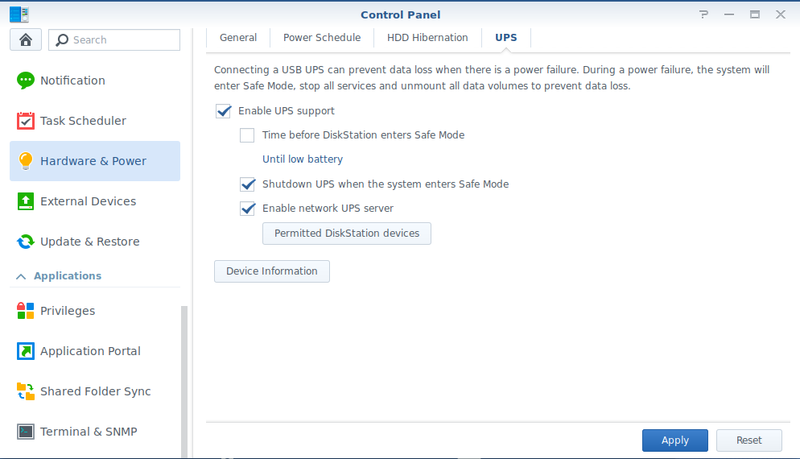 Just a quick hack to use the Node Red dashboard to monitor some of the UPS values that is attached to My Synology NAS. First I thought to do some sort of Python or NodeJS program to run the upsc command, process the output and feed it, through MQTT, to Node Red. But since it seemed to me a bit of overkill to just process a text output, transform it to JSON and push it through MQTT by using a program, I decided that I’ll use some shell scripting, bash to be more explicit. 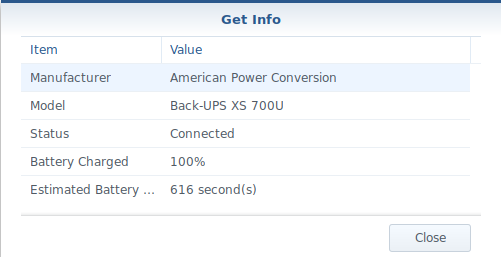 I’m running on my Odroid C1+ “server” all the necessary components, namely Node Red with the Dashboard UI module. So all we need now is to transform the above output from that text format to JSON and feed it to MQTT. print lline  "\42" $1 "\42:\42"$2"\42"
This will at the beginning print the opening JSON bracket, then line by line the parameter name and value between ” and separated by : . The lline variable at the first line is empty, so it prints nothing, but at the following lines it prints , which separates the JSON values. So we define the host and the topic: upsmon and the message is the output of the previous command (the -s switch). All we need now is on Node Red to subscribe to the upsmon topic and process the received JSON object. Since I’m running this periodically on crontab, I also add the PATH variable so that all files and commands are found. On node red side, now is easy. We receive the above upsc JSON object as a string on msg.payload, and we use the JSON node to separate into different msg.# variables. I run many services on my Odroid C1+ including Node-Red. But since NodeJs on Odroid C1+ is version v0.10 is starting to be seriously old for running Node-Red or other NodeJS dependent software. Since I’ve already had previously installed a more recent version of NodeJS (the node command), the version used by Node-Red is v0.12.14 while the default NodeJS version is v0.10.25. This will allow us to download the correct version of the NodeJS binaries from the NodeJS site: NodeJS downloads. and after a while the upgrade should be done. This is because the Odroid C2 has came out: Odroid C2, and if I think that the C1+ is great, what to tell about the C2, that is around the same price point? Several other tid bits very similar to C1+. So a major leap forward from the C1+ and from the RPi. The 40$ price in Europe is no near that value, but probably around 50/55€ mark, my guess ( + P/P). Also the eMMC prices are still very high, almost, or even higher, than the price of the board itself. Still I’m a bit wary of buying one since HardKernel (the Odroid manufacturer) only provides a 4 week warranty !? I bought mine in Europe, so I suppose it has a 2 year warranty by law. Just for a quick reference, the following instructions detail how to install the latest Mosquitto MQTT broker with Websockets enabled on the ODroid C1+ running (L)Ubuntu release. The instructions are probably also valid for other platforms, but not tested. Probably the SSL libraries, and a few others are also needed, but in my case they where already installed. Add at least the following lines to mosquitto.conf file to enable websockets support. If needed, or wanted, change also on the configuration file the logging level and destination. # "log_dest none" and neither stdout nor stderr logging is available. # Use "log_dest none" if you wish to disable logging. # value, e.g. "log_facility 5" to use local5. # multiple types of messages. # none, subscribe, unsubscribe, websockets, all. # network packets. They are not logged in "topics". # If set to true, add a timestamp value to each log message. echo "Starting Mosquitto MQTT Broker"
echo "Stopping Mosquitto MQTT Broker"
We can start manually the broker with the command /etc/init.d/mosquitto start, and stop it with the mosquitto stop command.